The IM360‑B has been designed for underground hard rock and underground soft rock mining—and supports both underground and surface simulator modules. This platform offers a combination of configurability and simulation realism. It delivers cutting edge technologies which dramatically increase realism to a level not previously seen by the underground mining industry. It ensures our customers have the world's best simulation solution to drive optimization and business improvements. When coupled with Immersive Technologies removable motion platform, the IM360‑B offers high frequency motion cues for seated machines, aligning operator movement with display upon the uninterrupted High Definition 360° display. Original Equipment Manufacturers, MSHA guidelines, and industry best practice are tightly integrated within the Advanced Equipment Simulators. This attention to detail, flexibility, and fidelity gives trainees more in depth machine knowledge and delivers rapid, correct and effective learning and assessment for your operation's needs. The IM360‑B features a high definition 360° display in an enclosed training area which limits unwanted light and sound, enabling a highly immersive and realistic training experience. This setup uniquely reflects the enclosed feel operators experience when working in an equipment cabin underground. The IM360‑B also supports surface mining simulation, with the 360° display ensuring operators have an accurate view all the way around the equipment during operation. With the ability to simulate both surface and underground effectively, the IM360‑B offers great value for mines wanting a versatile, feature-rich, high fidelity platform at an affordable price. All of our high fidelity Advanced Equipment Simulators are available in either classroom or transportable configurations. The classroom model has been designed to be installed in existing buildings and training areas. It allows trainers to oversee multiple simulators simultaneously and provides an open environment for group sharing and learning. The solid construction limits unwanted light and sound and allows for multiple simulators to be located close together. The transportable model can be moved relatively easily between sites and is self-contained; ideal when training space is not available indoors. Built to withstand the extremes of global mining environments, the transportable configuration has been designed with an IP54 rating for extreme dust and water proofing. Its temperature and airflow controls and reduced operating noise ensure optimal trainee and trainer comfort during training sessions. RealView dynamically adjusts the perspective of the trainee, providing a true real-world view outside the cabin while increasing their level of depth perception. Trainees can move their head to look around booms while drilling. As their perspective changes, they are able to check the angle of the drill steel or check for hidden hazards. 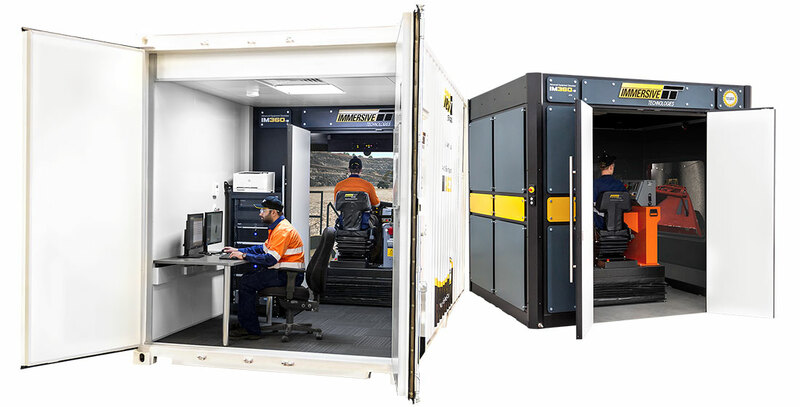 Recognizing the unique operating conditions of a mining environment, the 360° display allows the trainee to see in all directions replicating the conditions they will experience during real operations. The Enhanced Trainer Station is a dual-monitor interface that allows a trainer to better manage the simulator during a session. With the new advancements trainers can now, observe a 3D view, trigger events, review errors as they occur, generate reports, administer scenarios and learners all while running training sessions, vastly improving trainer efficiency. The two screen setup allows a trainer to administer the simulator on one screen while a view of the session is run on the second screen. New views of the simulation are part of the enhancement and include multiple fixed views and free-roaming camera settings which allow the trainer to view the learner's performance from any angle.